My generation is obsessed with blessings and it doesn’t take a genius to figure this out. All you have to do is take a not-so-critical observation of how we pray and think. It’s in our every proclamation. Pouring out from every pulpit and sucked in with desperation from every pew. Whoever you are, no matter how terribly blasé, villainous or tightly conservative you may be, you just laave blessings. I do. A lot. But, at a point in my life, along with figuring out life isn’t a fairy tale after all, I also discovered something else; blessing is a vague thing. I mean I know it’s a good thing but what exactly is it? And the dictionary made this even worse for me by providing not less than four definitions for blessing. You get the picture? When a person is somehow fortunate to have things that bring physical comfort, we nod our heads and call them blessed. Favored. Happy. Probably, but then it gets more confusing with the whole prosperity gospel going on in our churches today. Immediately the Pastor pronounces a blessing on you, he quickly proceeds with a succession of money, favor, health, connections, marriage, kids, yadda yadda pronunciations to accompany it. You can only make one conclusion. But, the other day I was studying the Bible and I was shocked. The people Jesus described were the poor (in spirit), the bereaved, the docile, those who were hungry and thirsty, the generally “too nice” guys who knew nothing, had nothing and sought nothing but God. They were the ones who were constantly spat on, degraded, lied about and generally hated to an unbearable point. Honestly, these people do not seem so blessed to me. They seem…miserable. Wretched. In fact, if they were from my part of the world, my people will call them accursed. “Dem don dey follow am for him village,”(a) they would say while they nod their heads sagely and pretend to throw spittle on the ground. Am I the only one who thinks this is weird? It makes no sense. At least no common sense. But that is what God tells us. So, what exactly is blessing? I’m not sure I know yet, but going back to the Attitude guys, we find out that there was something about them. During the process of their general misery (from the world’s assessment), they get a huge deal in return. And this makes me think that maybe the blessing is in this. And it wasn’t just about the fact that they were heaven-bound and had a reward from God. No. there was so much more. When you have the Master of all creation, the God of the Universe, the Love Himself, the Supreme commander of all as your Lord and Saviour, how can you want more? And this, is the real blessing! Have I disputed the place of material blessings? Nope. It will in fact result from the real blessing...but for a purpose. 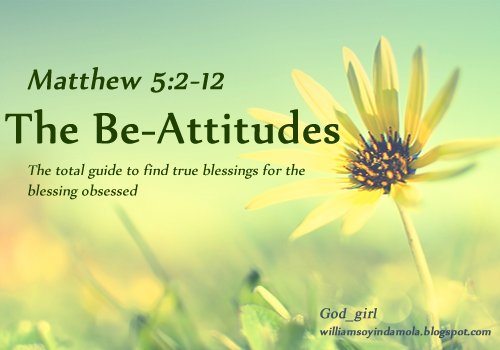 It's important we know that it is not the real definition of blessedness from God's perspective. Never forget that. a - "Dem don dey follow am for him village." Literal meaning: He is being followed by his kindred. Translation: He is under a spell.